here is the message of a recent piece of research: we are extracting too much water from rivers, streams and lakes. The implication is significant: unless there is enough water in the world's rivers to maintain freshwater ecosystems, many economies would collapse, affecting over 1.4 billion people who live in river basins. The study was conducted by the International Water Management Institute (iwmi), South Africa; the World Resources Institute, usa ; Center for Environmental Systems Research of Kassel University, Germany; and the World Conservation Union (iucn) , Switzerland. It demonstrates that a balanced water allocation policy is needed, one that provides sufficient water to the environment, as well as to humans. It is for the first time that researchers have assessed the impacts of water use on freshwater species. According to the 2003 iucn Red List of threatened species, 3,011 freshwater species are listed as threatened, endangered or extinct due to human activities. Across the globe there are examples of over-exploitation. 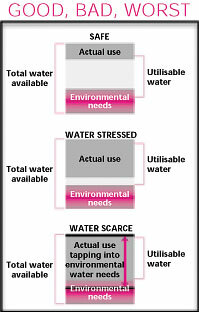 In both the Murray-Darling basin of Australia and the Huang Ho basin of China, more water is extracted than is available for human use -- a water stress indicator greater than one; extraction in the Orange river basin in southern Africa is close to using the maximum amount available -- a water stress indicator of 0.8 to 0.9. Climate change has made the scenario worse. In the case of the Huang Ho basin, for instance, the duration of the low-flow period has increased from 40 days in the early 1990s to 200 days in 1997. Such changes are alarming -- river flow is a must for the survival of freshwater species. A good example is the peril aquatic life is in the Pangani river basin, shared by Kenya and Tanzania. Its river flow has dropped from over 300 cubic metres per second to less than 40. Communities of the region now find it difficult to get fish even for consumption. The researchers found that ecosystems in river basins with extreme hydrological regimes need a lower proportion of natural run-off to maintain their functions because aquatic life has adapted to extended periods of limited or no flow. The aquatic life in basins where river flows are relatively steady, however, is more sensitive to water scarcity and requires a larger proportion of natural run-off. The level of 'stable flow' throughout the year plays a crucial role in deciding the environmental water requirement of such basins. According to the researchers, at present the environmental water requirements is 20 to 50 per cent of the total water available worldwide. "Allocation of water for environment should not be considered a waste. The study will enable communities to judiciously use their water resources," says David Molden, a researcher at iwmi.